Pickett's forceful, passionate style of singing was developed in the church and on the streets of Detroit, under the influence of recording stars such as Little Richard, whom he referred to as "the architect of rock and roll." In 1955, Pickett joined the Violinaires, a gospel group. The Violinaires played with another gospel group on concert tour in America. After singing for four years in the popular gospel-harmony group, Pickett, lured by the success of gospel singers who had moved to the lucrative secular music market, joined the Falcons in 1959. Soon after recording "I Found a Love", Pickett cut his first solo recordings, including "I'm Gonna Cry", in collaboration with Don Covay. Pickett also recorded a demo for a song he co-wrote, "If You Need Me", a slow-burning soul ballad featuring a spoken sermon. Pickett sent the demo to Jerry Wexler, a producer at Atlantic Records. Wexler gave it to the label's recording artist Solomon Burke, Atlantic's biggest star at the time. Burke admired Pickett's performance of the song, but his own recording of "If You Need Me" became one of his biggest hits (#2 R&B, #37 pop) and is considered a soul standard. Pickett was crushed when he discovered that Atlantic had given away his song. When Pickett—with a demo tape under his arm—returned to Wexler's studio, Wexler asked whether he was angry about this loss, but denied it saying "It's over". Pickett's version was released on Double L Records and was a moderate hit, peaking at #30 R&B and #64 pop. 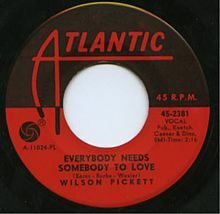 Pickett recorded three sessions at Stax in May and October 1965. He was joined by keyboardist Isaac Hayes for the October sessions. In addition to "In the Midnight Hour," Pickett's 1965 recordings included the singles "Don't Fight It," (#4 R&B, #53 pop) "634-5789 (Soulsville, U.S.A.)" (#1 R&B, #13 pop) and "Ninety-Nine and a Half (Won't Do)" (#13 R&B, #53 pop). 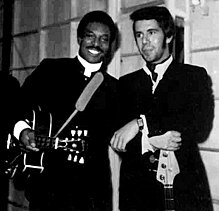 All but "634-5789" were original compositions which Pickett co-wrote with Eddie Floyd or Steve Cropper or both; "634-5789" was credited to Cropper and Floyd alone. "'A Man and a Half' is the quintessential Pickett title from this period—he's always striving to become more than he has any reason to expect to be." Pickett returned to Fame Studios in late 1968 and early 1969, where he worked with a band that featured guitarist Duane Allman, Hawkins, and bassist Jerry Jemmott. A #16 pop hit cover of The Beatles' "Hey Jude" came out of the Fame sessions, as well as the minor hits "Mini-Skirt Minnie" and "Hey Joe" (a cover of the Jimi Hendrix hit). Following these two hits, Pickett returned to Muscle Shoals and the band featuring David Hood, Hawkins and Tippy Armstrong. This lineup recorded Pickett's fifth and last R&B #1 hit, "Don't Knock My Love, Pt. 1". It was another Pickett recording that rang up sales in excess of a million copies. Two further hits followed in 1971: "Call My Name, I'll Be There" (#10 R&B, #52 pop) and "Fire and Water" (#2 R&B, #24 pop), a cover of a song by the rock group Free. Pickett recorded several tracks in 1972 for a planned new album on Atlantic, but after the single "Funk Factory" reached #11 R&B and #58 pop in June 1972, he left Atlantic for RCA Records. His final Atlantic single, a cover of Randy Newman's "Mama Told Me Not to Come," was culled from Pickett's 1971 album Don't Knock My Love. However, six years later, the Big Tree division of Atlantic released his album, Funky Situation, in 1978. Pickett appeared in the 1998 film Blues Brothers 2000, in which he performed "634-5789" with Eddie Floyd and Jonny Lang. He was previously mentioned in the 1980 film Blues Brothers, which features several members of Pickett's backing band, as well as a performance of "Everybody Needs Somebody to Love." Pickett's personal life was troubled. In 1991, he was arrested for allegedly yelling death threats while driving a car over the front lawn of Donald Aronson, the mayor of Englewood, New Jersey. Pickett agreed to perform a benefit concert in exchange for having the charges dropped. He would perform as his community service. Pickett was the father of 4 children. 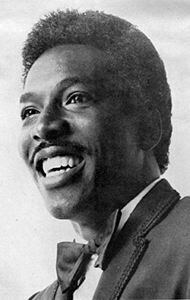 In 2005, Wilson Pickett was voted into the Michigan Rock and Roll Legends Hall of Fame. On September 10, 2014, TVOne's Unsung program aired a documentary that focused on Pickett's life and career. Pickett died of a heart attack on January 19, 2006, in Reston, Virginia. He was 64. He was laid to rest in a mausoleum at Evergreen Cemetery in Louisville, Kentucky. Pickett spent many years in Louisville. The eulogy was delivered by Pastor Steve Owens of Decatur, Georgia. Little Richard, a long-time friend of Pickett's, spoke about him and preached a message at the funeral. Pickett was remembered on March 20, 2006, at New York's B.B. King Blues Club with performances by the Commitments, Ben E. King, his long-term backing band the Midnight Movers, soul singer Bruce "Big Daddy" Wayne, and Southside Johnny in front of an audience that included members of his family, including two brothers. "I'm Down to My Last Heartbreak"
b/w "Let Me Be Your Boy"
"I Found a Love – Part I"
"I Found a True Love"
"A Man and a Half"
"Don't Knock My Love – Pt. I"
"Call My Name, I'll Be There"
"Take a Closer Look at the Woman You're With"
"Take Your Pleasure Where You Find It"
1981 "Ain't Gonna Give You No More"
^ "EMI America Records Discography" (PDF). Bsnpubs.com. Retrieved October 27, 2017. ^ "Bio". Official Website. Archived from the original on July 23, 2012. Retrieved May 8, 2012. ^ "The Violinaires discography". RateYourMusic. Retrieved October 27, 2017. ^ "Independent Music Awards – Past Judges". Independentmusicawards.com. Archived from the original on July 13, 2011. Retrieved February 6, 2012. ^ "Wilson Pickett Obituary on Legacy.com". Legacy.com. Retrieved October 27, 2017. ^ Rock, Doc. "The Dead Rock Stars Club 2006 January To June". Thedeadrockstarsclub.com. Retrieved October 27, 2017.